Located just an hour west of Calgary, Peter Lougheed Provincial Park (www.albertaparks.ca/peter-lougheed) is an area of striking contrasts. From towering mountains and pristine lakes, to undisturbed meadows and peaceful streams, the scenery changes rapidly as you wind your way through this Southern Alberta natural wonder. 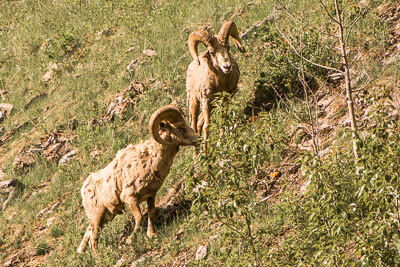 It’s not unusual to see Rocky Mountain sheep, or even bears alongside the highway that bisects the park. And then there are the gorgeous sunsets and star-filled night skies. In short, it’s some of Mother Nature’s best handiwork. And although the park is rather rugged and remote, it’s still very doable for wheelchair-users and slow walkers. First off, the folks at Alberta Parks place a high priority on access, as they continue to make access upgrades and promote inclusion throughout the park. Additionally, you don’t have to rough-it if you want to stay a few days, as a very luxurious and accessible lodge is located just 10 minutes away. And last but not least, there’s certainly no shortage of great windshield views and scenic drives within the park, so you don’t even have to get out of your car to enjoy the beauty of it all. The best place to begin your visit to this 500-square kilometer park is at the Visitors Center, located just south of King Creek. Accessible parking is located near the Visitors Center, which features level access and a number of interpretive exhibits. Unfortunately the building sustained damage in the June 2013 flood and it is now closed. In the interim, a temporary information desk is set up down the street at William Watson Lodge. The buildings in that complex are also accessible, as it was purpose-built for disabled Albertans. The timeline for completion of repairs to the Visitors Center is unknown, but updated information is available at (403) 678-0760. Even though the Visitors Center is currently closed, the Rock Wall Trail, which is just outside the building, has been cleared of flood debris and is open. This paved loop is just a half-kilometer long and it leads through pine and spruce forests. Near the half-way point there’s an overlook, which offers a panoramic view of the adjacent meadow framed by the Opal Range. This wide level trail is accessible to everyone, and it’s a great place to enjoy the sunset. Several other accessible trails are located up the road. Just follow the signs to the Elwood Amphitheater, and pull into the large parking lot. There are no accessible spaces in the lot, but there are some unmarked spots around the perimeter that can accommodate accessible vans. To access one of the most scenic trails in the park, follow the bike trail to the amphitheater, then take the hard-packed trail through the forest, and cross the RV campground. 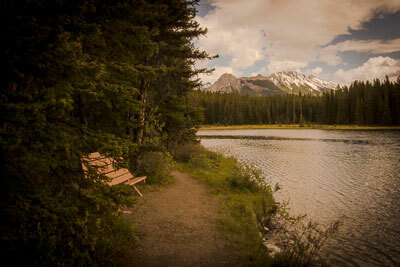 You’ll find the trailhead for the Marl Lake Trail just past the accessible pit toilets. This hard-packed trail features boardwalk access over the wetlands and offers an absolutely beautiful view of the Continental Divide with Marl Lake in the foreground. Some manual wheelchair-users may need a bit of assistance over the undulations in the trail, but for the most part it’s level and accessible. 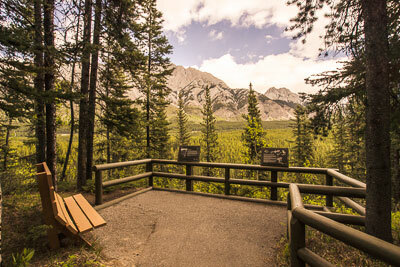 Pack along a lunch and enjoy it on one of the many benches that dot the trail. It’s a three-kilometer round-trip hike from the Elmwood Amphitheater parking lot, but you don’t have to do the whole trail if stamina is an issue. Finally, if you still haven’t had your fill of hiking, then cross the road in front of the Elmwood Amphitheater parking lot and turn left on the Bill Benson Trail. 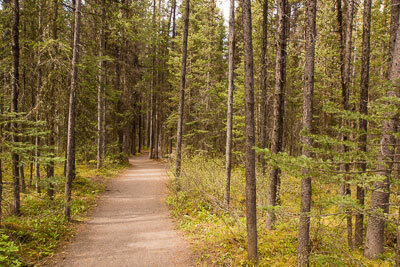 This wide, level, asphalt trail winds through the forest and connects to the half-kilometer Lower Lake Trail. And last but not least, don’t miss the paved one-kilometer Spruce Road Trail, which winds through a pine and spruce forest. You can access it from the Bill Benson Trail or William Watson Lodge. And if you’d like a narrated hike, then pick up an audio tape guide at William Watson Lodge. It’s the perfect end to a scenic Southern Alberta visit.